This week, the National Geographic Museum in Washington DC opens a wonderful show centered on the fantastic Ceramic Warriors found in China in the grave of China's first emperor, Qin Shihuangdi, 35 years ago. These objects date to the 3rd century BC, and of that army of soldiers, 15 warriors and related artifacts including a full size horse are now installed in the newly designed Museum space. It's a dramatic history lesson in clay of a buried past by an ancient culture a hemisphere and 2 millennium away. It's accidental discovery by local farmers sounds more like fiction than history, a story better suited for movies than museums. The Washington Post has a photo essay here and an article here. Looking at the figures outside their context, with little understanding of their original intention, Art and sculpture are among the only words to describe them. I was honored to be involved in the installation. This is an ultimate project. How do you prepare or train for something like this? For an Artist/ Art Handler it's the mountain top. 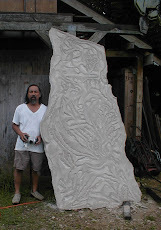 As a stone carver much of my own inspiration comes from what remains of Antiquity. I was eager to meet the Warriors. To be able to practice in public the work you do in private is a privilege. Friends who run a local Art Handling Company asked if I would want to be considered as the rigger for the project. The Warriors are fragile, heavy and difficult to handle. The project scope required a rigging/ sculpture specialist. They could provide an introduction. Our initial meeting with the Museum's staff in charge of the installation went well, I left with a folder of pictures, crate sizes and floor plans which I promised not to lose. Months later I found myself bringing my gantry, slings and misc. rigging tools in my pickup to the museum. This level of anxiety is fuel and I enjoyed the preparation. The degree of complexity required a commensurate response. I was warned ahead of time that there would be an official group of Chinese specialists responsible for the installation and although an interpreter would be involved, I should expect a language barrier. I looked forward to this point, I would have to speak through the quality of my presentation, tool choices and anticipation of their motives. When the first day arrived, on our introduction, I knew immediately who the Master was. I bowed and said I was in their service. After our hellos and a few unsure words I took them outside to show them the unassembled parts of the gantry. The Master nodded. Opening the first crates felt like releasing a message in a bottle. I was unprepared for the figures individual expression and physical presence...We were asked to float each Warrior from their padded protected case to their display destination. 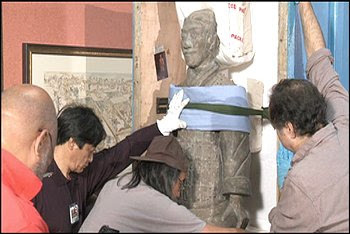 The Chinese specialists spoke in hieroglyphs and gesture. It was like music, someone would count and on 4 we all would assist on the beat to the spot. On September 30, The National Air and Space Museum on the National Mall in Washington, D.C., opened a Public Observatory to celebrate the International Year of Astronomy. Inside, "... the centerpiece of the Public Observatory Project is a 16-inch Boller & Chivens telescope. The telescope was originally part of Harvard-Smithsonian's Oak Ridge Observatory in Harvard, Massachusetts. It was used for astronomical research until recent years, and is now on loan to the National Air and Space Museum for the Public Observatory Project." I was fortunate to be involved in this project early, helping to prepare details for installation scope and pricing and also serving as the technical advisor, in DC, between the Air and Space Museum and the art handling company which was awarded the contract. The installation of the actual Observatory would be undertaken by a local crane company. I was to be the on-site lead object handler/ rigger for the installation of the telescope under the direction of the great staff at the Museum who put the project together. I saw that they treated the telescope as sculpture and wanted art and art handlers. Conceptually, this was close to what I have been thinking about since I found Marcel Duchamp: the re-examined object. The telescope arrived @ the Museum in 4 major components. The heaviest was about 1000 lbs. The doorway entrance was 38 1/4" wide, the largest telescope part was at 38" wide on a pallet 42" wide. I remember going to a meeting at the Air and Space Museum where a room of experts met to discuss individual responsibility. As each of us described our parts and answered questions, I was asked to give details on how we were going to get everything in the room through the door: telescope parts, misc. tools, gantry and crew with a floor diameter of 22', as there would be many physical problems to the observatory, including an incomplete dropped floor with exposed plastic conduit which had to be surface protected. Access to finished floor height would be made after the installation. I don't remember how I answered that. For many personal reasons this project brought to closure an adventure that began as an Art student trying to understand how to handle difficult heavy stones for sculpture. Rigging started as a studio endeavor with ropes and old scaffold and slowly progressed to slings, gantry's and cranes as I began to recognize the rules of rigging and how these rules are used to communicate safety to others in the field, especially with people you have just met on the project site. Proficiency in hand signals, strapping techniques, knots, etc.. is a shared language. Expertise is apparent immediately. Going from project to project, often in different cities and countries, with unknown contractors and crews allows all the responsible parties a way to talk. Each decision underlines how much each of us knows in the moment. For me to have been able to find myself in this environment participating in a dream project with other passionate professionals, working on a crew of best friends I taught and learned from with tools I chose and helped buy, answered many questions about the quality of my own work and direction. It also made me thankful for the hidden gifts of the Art life. Many of us are asked what are we going to do with Art when we are students. I said I didn't know and probably didn't care. To travel idiosyncratically as Artists do day to day, and then find that the life style has value is very much a surprise. For example, I am currently on a project which I'll blog about later, but it involves a Chinese crew responsible for installing large, heavy, beautiful objects with only a minimum knowledge of English. They represent a Collection which humbles me. Through mutual hand signals and techniques we're talking. During a particular difficult rigging moment, they were speaking in Chinese and I responded in English and our hands moved in similar directions. Afterwards we looked at each other and just laughed. video music: " excerpt Digging a Hole."